Bruno Schleinstein, a musician, actor and painter known more widely as Bruno S, died in August 2010 at the age of 78. Born in Berlin in 1932, the illegitimate son of a prostitute, he was left in an asylum for children with learning difficulties at a young age and narrowly escaped being put to death during the Nazi era for being an undesirable. Despite lacking a formal education, he taught himself how to play musical instruments including the piano, accordion and glockenspiel. After being released, he would busk and sell his own paintings in the street at weekends, an artistic career that he supported by working full-time in a steel mill. If you’ve heard of Bruno, then it’s probably thanks to Werner Herzog, who spotted him in a 1970 documentary, Bruno der Schwarze – Es blies ein Jä;ger wohl in sein Horn, and cast him in The Enigma of Kaspar Hauser (1974). Bruno’s obituaries have rightly tried to reflect his entire career as an outsider artist, but here I want to concentrate on his role in Kaspar Hauser. The Enigma of Kaspar Hauser is being re-released in UK cinemas by the BFI on 5 July 2013, screening at BFI Southbank, Filmhouse Edinburgh & selected cinemas nationwide. For more information on screening dates and times visit the BFI website. 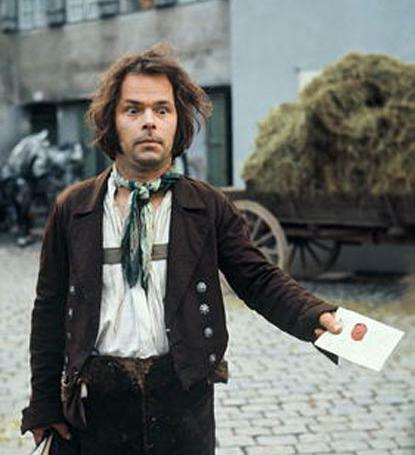 Based on a true story from 19th-century Nuremberg, Kaspar Hauser tells the story of a man who has spent his entire life locked in a dungeon, with no contact with the outside world. Dumped in the town square by his (un-named) captor, he becomes an object of local curiosity, until he is taken in by a kindly old gentleman who tries to civilise him through education. This is ripe material for Herzog to thumb his nose at conventional social mores, Kaspar’s naive questions illuminating the absurdities of 19th-century bourgeois life (‘why are women only allowed to cook and knit?’), but perhaps more surprising is how emotionally raw and tender it is. What makes the film so interesting is that to do this, Bruno, as Kaspar, has to establish a completely original way of communicating feeling to the viewer. He enters the film as a character who has been completely cut off from normal social contact; his actions are jerky and unpredictable at first, his eyes stare; he utters his brief lines in a slow, deliberate way, as if plucking the words from the distant reaches of his memory. As we follow Kaspar’s progress through a world in which he is treated first as a criminal, then as a freak, then as an object of intellectual curiosity, we are drawn into seeing the world on his terms. Kaspar begins with complete trust of others, yet he comes to see people as ‘wolves’ and is frustrated by the failure of life outside the dungeon to live up to his expectations. ‘Why is everything so hard for me? Why can’t I play the piano like I can breathe?’ he exclaims at one point. Despite an acting style that follows none of the usual conventions for emotion, this is an almost unbearably poignant outburst. Herzog is famed for his choice of social misfits as documentary subjects or lead actors for his films – to the extent that an attractive mythology now surrounds the director’s work. It’s one that Herzog has encouraged; his own tussles with wild nature (recorded in the book On Walking in Ice, or the diaries he kept while making Fitzcarraldo) mirroring his struggles to work with uncooperative and unpredictable actors like Bruno, or the better-known Klaus Kinski. In the case of Kaspar Hauser, though, all this threatens to obscure what is a subtle and controlled collaboration between actor and director. This is best illustrated by a scene in which Kaspar recounts a dream he has had about the Caucasus, using an odd grammatical construction: ‘Mich hat geträ;umt’, which literally means ‘it dreamed to me’. This is immediately followed by flickering cine-footage of a strange land. You can interpret this sequence in a linear way: perhaps this is the land Kaspar has dreamed of. But perhaps it is also a metaphor for the way films present us with dreams that in the real world will always be tantalisingly out of reach.